Portal 2's first DLC package has been announced, and it'll be totally free. The official announcement of the Portal 2 DLC that Valve announced it'd be announcing is here. The package Valve is calling Portal 2 DLC #1 for now will arrive in summer 2011 on all platforms and won't cost players anything. What's the catch? 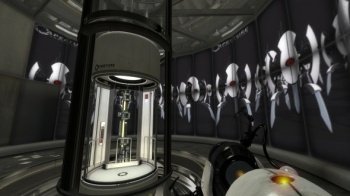 Valve and Aperture Science get more testing data, that's what, which you know they're using for something devious. Portal 2 DLC #1 wasn't detailed very much in the official announcement, sadly, but more information will probably come with some incredibly mysterious alternate-reality game that'll require fans to read Huckleberry Finn and follow clues to a South American jungle where Gabe Newell is waiting with a fact sheet. I mean, how else is Valve going to top itself after its last ARG? What we do know is that DLC #1 will feature new test chambers, leaderboards, a challenge mode in both single-player and multiplayer, and more. The "challenge mode" seems to hint toward something that might give players a timer that'll record how quickly they can complete chambers or other specific goals. "More" could mean anything from new music to new test chamber mechanics to a 10-hour expansion of the game's storyline and preview of Half-Life 3. And again, this DLC will be completely free. If you don't like things that are free, you're welcome to mail Valve a check on your own accord.